An outstanding piece regarding the Las Vegas housing market was reported in the Las Vegas Sun here. 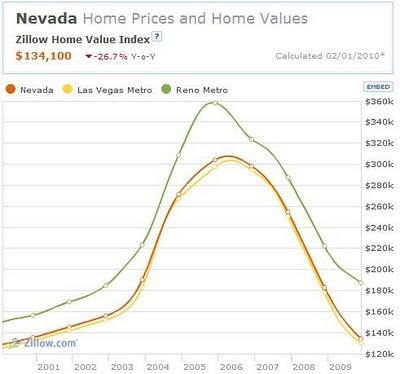 The Las Vegas Sun article reports that housing prices have stopped their decline. Another article came out in today’s Wall Street Journal regarding room for cheer in the Las Vegas housing market. The Wall Street Journal Article highlights the difficulty buyers who intend to “occupy” housing are having competing for entry level housing in Las Vegas. The data upon which those optimistic articles are based is wrong, and prices in the high-middle and high-end still have a way to drop states a Metro Study Report here. Let’s put it this way: with 80% of Las Vegas mortgage holders now upside down, the second highest unemployment rate in the nation (13 percent official rate), tourism, gaming and tax receipts in a complete free fall, and foreclosures rising, I see no end in sight (till around 2012 /13) for our local housing collapse states an article in Seeking Alpha here. Housing prices are a false flag and prices will still continue to fall as 1) credit continues to tighten, 2) unemployment increases, 3) Alt A mortgage resets begin to pick up steam (through 2012), 4) uptick in strategic foreclosures (those who can afford to pay, but still walk away), and 5) banks begin to unload the tens of thousands of foreclosed homes that are being held off the market, states the Seeking Alpha article. Thanks for the commentary…I’d prefer that we were wrong but it’s difficult to conclude (given our survey) otherwise.